We finished breakfast and got ready to check out and head to our Disneyland hotel. We decided to go with Option 1 as our experience with lugging our luggage via the Paris Metro on our first day at Paris was enough to deter us from taking the train! Even though the taxi costs almost 3 times more than public transport, it was worth it for the convenience. 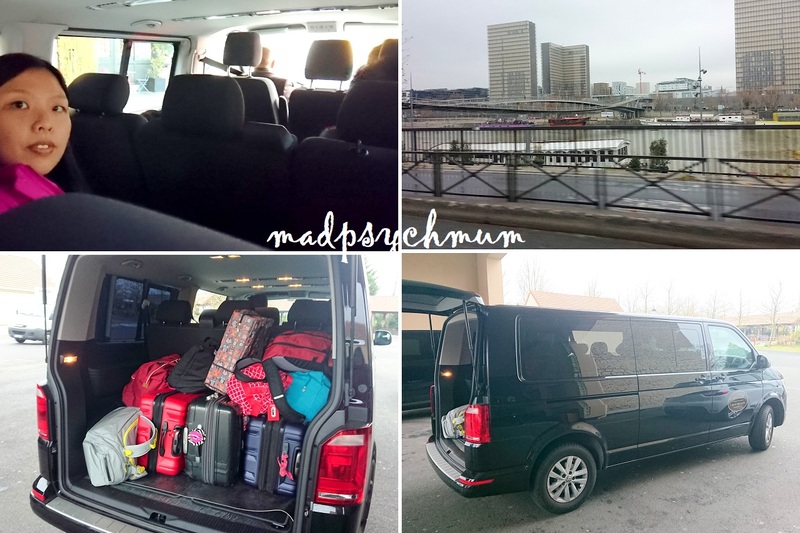 The taxi was large enough to accommodate 8 persons and at least 4 extra-large luggage so if you've got a lot of people in your group, it's even more worth it. We arrived at Explorers Hotel, one of the official hotels of Disneyland Paris. The hubby chose this hotel for its kid-friendly facilities and family rooms. The Check-in counter is a pirates ship! 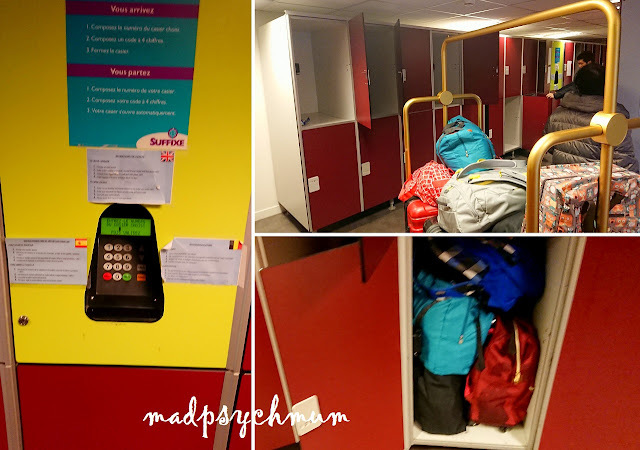 As our room will only be available at 3pm, we locked our luggage at the hotel's lockers (this service is provided FREE) before heading out to do some shopping at the nearby malls. Easy to use self-locking system. The lockers were also large enough to put even our biggest luggage (and we had A LOT of luggage!). We took the hotel's FREE Shuttle Service (Bus HVFS) to Marne-la-Vallée Chessy Station, which is also located next to Disneyland Paris. Explorers Hotel's shuttle bus to and from Marne-la-Vallée Chessy Station/ Disneyland Paris. At Marne-la-Vallée Chessy Station, we tried to buy our RER train tickets from the machines, as we have always done. After queuing for 20 minutes, we realised that the machines didn't have English instructions! Thankfully some French teenagers were queuing behind us and they helped us buy the tickets! They were really sweet and helpful! So thankful to them! We took RER A to Val d'Europe Station (just one stop away) at €1.90 per person per way. Unlike the Paris Metro, you'd need to keep your RER ticket as you will need it to exit. I must be some frog in the well to be so amused by double decker trains as I've never seen them before! First time seeing stairs in a train. We had lunch at Restaurant Pizza Di Roma because as usual, the hubby had a good feeling about this restaurant even though it looked to be rather empty. And as usual, he was right because the restaurant was full just 15 minutes after we sat down. 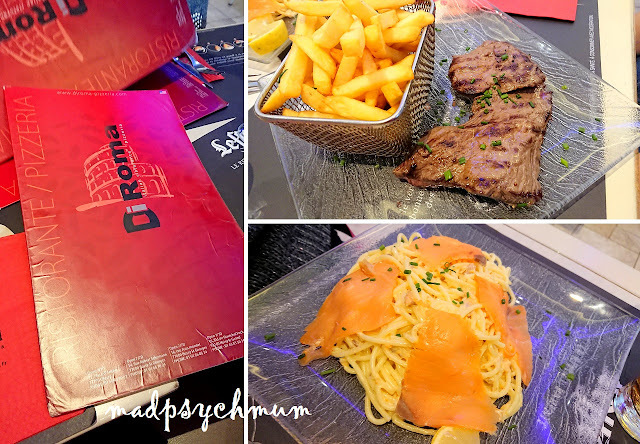 We ordered beef steak and salmon spagghetti. The restaurant was, of course, also famous for their pizzas but we're not pizza people. After lunch we walked through Val d'Europe shopping mall to get to the outlet shops at La Vallée Village. It's a really huge mall with a lot of shops and restaurants! We walked for about 20 minutes before we reached the other end, which is linked to La Vallee Village. Outlet shopping along this street! Shopped and bought stuff at Michael Kors and Longchamp! So much cheaper here. 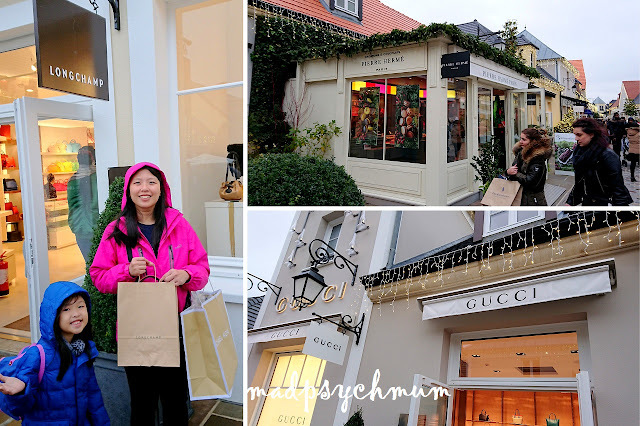 Too bad the queue at Gucci was too long and it was raining so I didn't get to shop there. Although I managed to buy bags here, I was disappointed that there weren't other brands I love such as Prada, Tods or LV! So sad that I didn't manage to buy a new wallet for myself. After shopping, we stopped by Paul at Val d'Europe for, you guessed it, our favourite croissants! We bought our dinner to be eaten at our hotel and headed back. Our room was definitely ready for us by the time we reached back to our hotel. We booked the Quad Room at S$169.67 per room per night via Agoda. The room accommodates 4 persons and includes breakfast (more details in the next post, link at the end of this post). 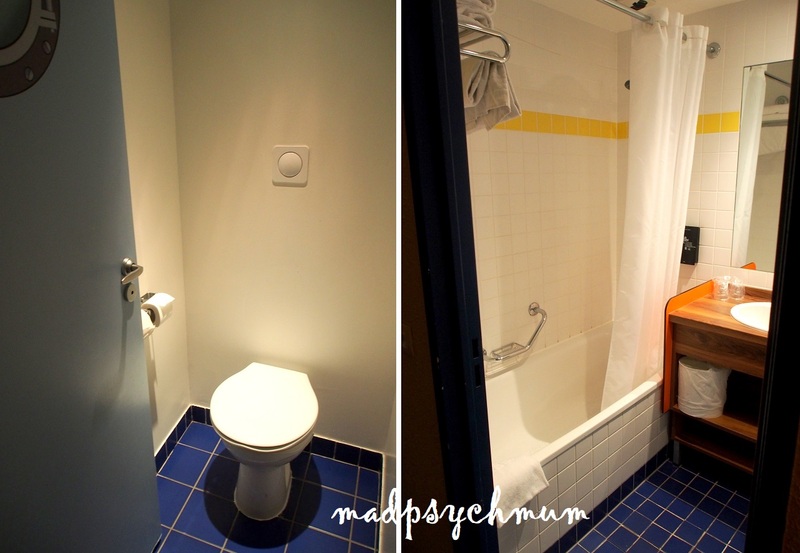 The toilet and bathroom is once again separated. The bathtub is a good size and perfect for warm baths in the freezing cold weather. 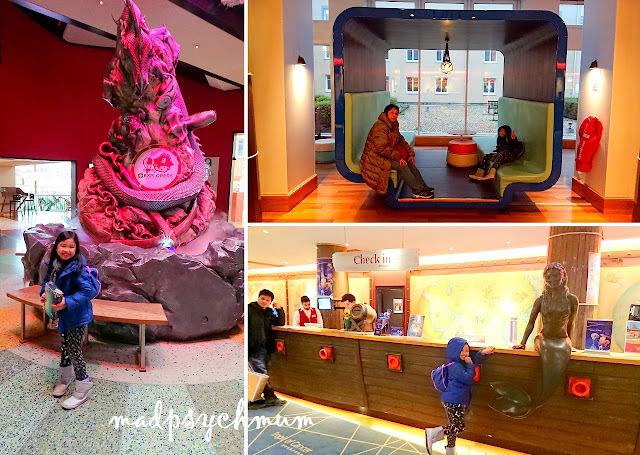 The hubby and I booked Explorers Hotel for the many kid-friendly activities that they offer! This pool is indoor and heated so that everyone can have fun, even in winter! 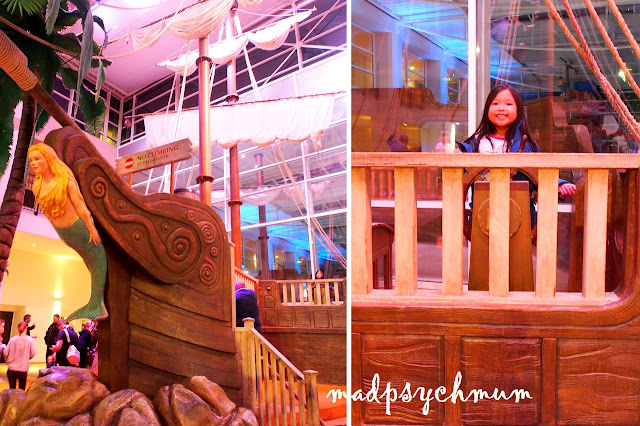 The huge pirate ship and 3-storey dragon slide are the highlights of this pool! My girl had sooo much fun! Do note that NO TOWELS will be provided and you are NOT allowed to use your hotel room's towel! Please remember to bring your own towels or you would have to buy one from them or the Disney Shop. And most importantly, don't forget to bring your swim wear! You would not want to miss checking out this pool! The girl had a lot of fun playing here before she went to bed every night! This is an indoor playground that is FREE for all guests! The girl was really looking forward to playing there but unfortunately, it was closed for maintenance when we were there! Super SAD! Following the pirate theme once again, the outdoor playground is yet another pirate's ship! My girl really wanted to play there too but it was simply too cold in the winter! There's also a 6D Theatre within the hotel but each show costs €5 per person. However, with so many free activities to do in the hotel, hardly anyone pays to watch the 6D show! There's also a video arcade and even pool tables (pool tables located outside the Disney Shop) to entertain the older kids. Lastly, you can also shop at the official Disneyland Paris Boutique without squeezing with everyone else. They may not have a lot of variety but I'm sure that you would be able to find something you'd like. I found a beautiful Minnie and Eiffel figurine that fits perfectly in my collection! Can't wait to visit Disneyland Paris tomorrow, woohoo!